Pasture Raised, Grass Fed, Naturally Raised & Free Range! ….What does it all mean? We use terms like pasture raised, grass fed, naturally raised and free range to describe how our stock enjoy their life. For example, our cattle graze year round on pastured and forested areas where they have an abundance of space, fresh air and forage; fulfilling the terminology listed above. In the summer months we graze using intensive pasture management methods called “rotational grazing.” Using portable solar powered electric fencing, we subdivide our large fields (80-160 acres) into smaller fields (10-20 acres) and move the heard every few days onto fresh grass. The cattle eat the entire small section of pasture which improves plant and soil biota through naturally managing weeds, fertilizing, and increasing root production which also sequesters more Carbon. Intensive rotational grazing reduces our Carbon footprint! In the winter, pastures are dormant and not growing. We leave some pastures alone in the summer for residual forage to graze in the fall and winter, though the bulk of our winter feeding is made up of home and locally grown hay. To benefit the pastures, cattle and environment, our cattle are fed using the method of “bale grazing.” Bale grazing is where hay bales are spread out in the field about 20ft apart from each other. We section off a certain amount of bales at a time using portable electric fences. These fences are moved every few days as the herd consumes their feed. This keeps them eating on clean ground, distributing “natural” fertilizer”. 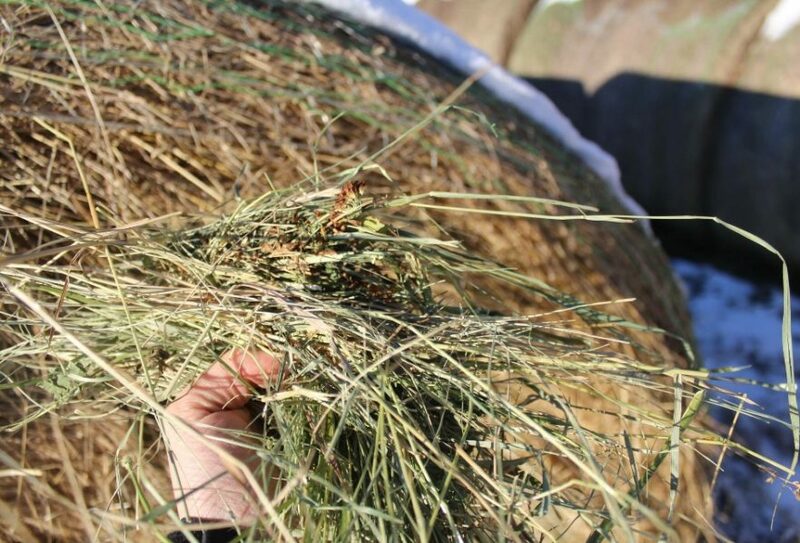 The residual hay that is not consumed aids to hold moisture on the soil, prevent erosion and increase the organic matter on the soil surface. In our opinion, this is one of the most effective ways to benefit a pasture and feed cattle effectively, efficiently and in an environmentally friendly manner. Please feel free to ask more questions about our feeding operation. EVER BEEN TO A CHICKEN PICK UP PARTY? !